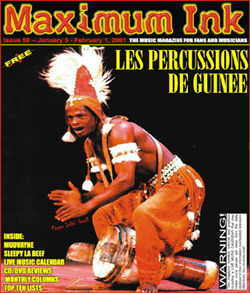 A heavenly outpouring of throbbing jubilation, forceful uplifting beats and pounding enthusiasm, Les Percussions de Guinee’s djembe drumming is vibrant and hypnotic, a tumbling tapestry of blustery resonance and driving rhythms. International cultural ambassadors, this government sponsored ensemble takes the most talented players from their Les Ballet Africains and competing regional companies to showcase this rhythm nation’s complete complement of percussion instruments, including log drums, water drums, five headed drums and a xylophone predecessor called a balafon. Playing with celebrities as diverse as Harry Belafonte, Elvin Jones, and the Police, this dancing, drumming storytelling troupe represented their country in the worldwide touring company of Africa Oye as well as Imax’s new production of global rhythms hosted by British performance artists Stomp. Thunderous and uproarious, the fifteen-member troupe presents thousands of years of tradition with decades of experience. Their groundbreaking use of female drummers reinforces Mickey Hart’s belief that before man took over the drum for their military communications, the women were the principal performers, linked to various fertility rituals. Historical speculation aside, the current version of the Ensemble is one of the best. With three new members, bringing one of Guinee’s chief folklorist out of retirement, the addition of flute and the twenty-two stringed kora, Les Percussions de Guinee 2001 blends youth, wisdom and perspective, moving the group from a remarkable drum circle to a phenomenal panorama of a rich musical culture. Having created a marvelous ruckus at the World Music Institute’s November concert in New York, the troupe needed to escape from the city’s constant requests for performances and private lessons. Preparing for concerts from Wisconsin to California over the next few months, the group hooked up with their friend Matt Mueller. Matt enlivened the Madison music scene with his handmade drum shop Timeless Voices and was a natural ally for the ensemble’s many traditional wooden instruments. One thing led to another and Matt offered them temporary asylum in Madison. In turn, they asked if Matt would assume the responsibility of managing the groups website www.percussionsdeguinea.com (defunct) as well as establishing a central location for performance requests while the group tours. Strange, but true, Madison, WI is the info-hub for West Africa’s premiere percussionists. Wisconsin will be amply rewarded when the ensemble’s grueling rehearsal schedule reveals itself in shows around Wisconsin; January 14th at the Grand Opera House in Oshkosh, January 18, 19, 20 & 21st at the Miramar Theater in Milwaukee, Stevens Point’s Michelsen Concert Hall on January 28th and Madison’s Oscar Mayer Theater in the Civic Center on February 4th in 2001.